Daria Lytovchenko plays Rita in the opera Rita, composed by Gaetano Donizetti. 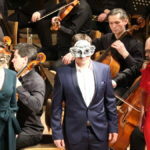 The opera is being staged at the Kyiv Music Theater (Kyiv State Municipal Academic Opera and Ballet Theatre for Children and Youth). Director of the staging is Lada Shylenko.